Way back in the depths of winter I booked my ticket to see Yoko Ono. Last weekend, I got to hear her talk at the Sydney Opera House about her life and work and saw her exhibition ‘War Is Over! (If You Want It)’ at the Museum of Contemporary Art. I had always been a big Beatles and John Lennon fan and have even stood outside The Dakota building in New York where Lennon was shot and Yoko still resides, but I was never really au fait with Yoko’s art. Yoko has been making art for over 50 years and still continues to this day, as well as campaiging for peace, environmental issues, singing and performing. Wow. The exhibition was beautiful and there were a few pieces that affected me emotionally, participation pieces, bronze sculpture, drawings, film, voice to name but a few. The conversation at the Opera House with Rachel Kent (MCA Chief Curator) was enlightening, motivating and moving. Yoko is an intelligent, gentle woman and it is a shame that her art has been relatively unknown until recent times. 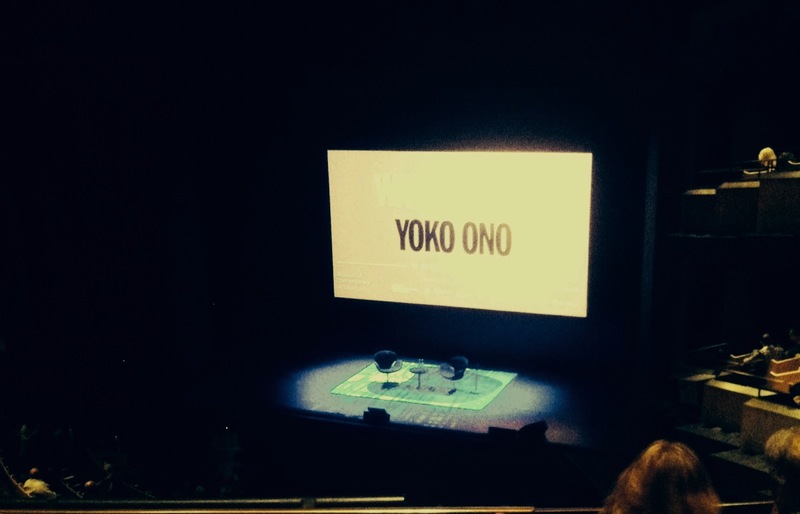 I am so glad that I went to Sydney to see the exhibiton and see Yoko in conversation and encourage you to see it over the next few months. (except for the one below on my phone!). I’m back with my camera, and hence, love it a little more.